Today would have been Linus Pauling’s 113th birthday, a great chemist famed for his seminal work on the chemical bond, which won him the 1954 Nobel prize in Chemistry and laid the foundations of molecular biology. His work had implications in many many scientific fields and today we’re presenting the structure of the mineral Hematite that Pauling and a co-worker determined. a visualisation of the first structure determination for hematite by Puling in 1925. The green atoms are Iron and the grey oxygen. It was drawn using the Diamond Visualisation software. Hematite is Fe2O3. It is one of the earliest pigments used by man. It produces an orange-red colour and this mineral’s abundance and widespread of easily found deposits across the globe has made it one of the most well-known and widely used pigments. As well as being a pigment it is also the main ore of Iron and the principal export of Australia producing an income of $AUD 57,000 million in 2013. The name hematite comes from the greek word “hema” which means blood. Hematite varies in colour from silver-black to orange-red and if you have ever got any of the red stuff on your hands, you can immediately see why it is used as a pigment – it sticks to everything and a little bit goes a very long way. The two commonly recognised morphologies and colours of hematite. Credit: Wikipedia. The first recorded use of this mineral as a pigment was 164,000 years ago in South Africa and early man used it as a red chalk to write and draw with. It is often found in association with another form of Iron oxide, Ochre. Together with Ochre, hematite is the basis of many red pigments from around the world such as Venetian red, Indian red and Terre Pozzuoli. As a pigment, hematite is considered a permanent pigment – this is one of the reasons for its popularity. This is due to the reactivity of the material. It does not react with most solvents or alkalis and requires an acidic solution for only partial dissolution, thus, it is very stable and persists through long-time periods in history. It can dissolve a small amount of oil, which also helps to make it an excellent choice as a pigment in painting. 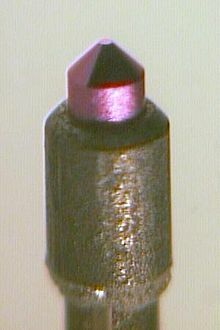 The structure of hematite was first determined by Pauling in 1925. 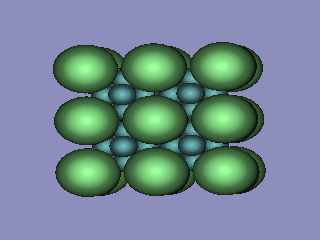 This was the fifth structure that Pauling had determined. 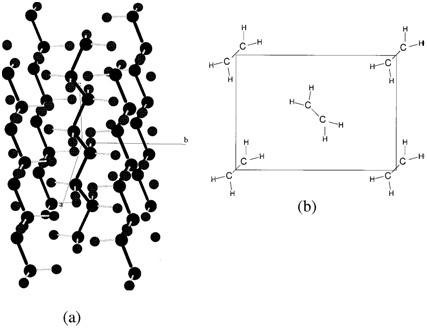 Also in the paper, he discusses the structure of Corundum and corrects the earlier structure determined by the Braggs. Pauling, L and Hendricks, S., The structure of Hematite and Corundum. (1925) Journal of the American Chemical Society 47, 781 – 790. Crystalline structure of polyethylene. (a) Side-view of orthorhombic structure of polyethylene. (b) Projection of unit cell on the ab plane The larger circles represent C and the smaller circles represent H.
Polyethylene, the most commonly used plastic and synthetic polymer is a recyclable thermoplastic that can be melted and blown, poured or pressed into a multitude of useful shapes. Polyethene comes in many structural forms classified by density, degree of chain branching and crystallinity. The two most well-known variants are low-density polyethylene (LDPE) and high-density polyethylene (HDPE). The repeating unit and chains of polyethylene. LDPE is composed of highly-branched polymer chains that do not pack closely together and are randomly oriented relative to one another, i.e. LDPE is amorphous. The large distance between adjacent polymers weakens the intermolecular forces between polymers which are easily overcome, thus LDPE has a low melting point and is highly flexible. LDPE is hence used to make cling wrap, food containers and playground slides. LDPE was first produced in 1933 by the free radical polymerisation process. The recycling number for LDPE is 4. HDPE polymers have a low degree of branching that pack closely together in highly ordered or crystalline arrays. HDPE has a greater density than LDPE and stronger intermolecular forces, thus is harder, more rigid and has a higher melting point. HDPE is used to make water bottles, water pipes, hard hats and garden furniture. The recycling number for LDPE is 2. Early x-ray diffraction measurements by C.W. Bunn and co-workers at ICI determined that polyethylene formed materials that was about 50% amorphous and 50% crystalline. This property, a mixture of order and disorder, makes polyethylene and other polymers very difficult (but also very interesting) to study. Density Functional Analysis of Impurities in Polyethylene http://electronicstructure.wikidot.com/density-functional-analysis-of-impurities-in-dielectrics. Accessed 24 Feb 2014. Lanthanum hexaboride (LaB6) is widely used as a high-performance source of electrons for electron guns in electron microscopes and other instruments. However, LaB6 is most familiar to crystallographers in its role as a beautiful purple standard material, for which it is well suited due to its stability and high crystallinity. So how is it put together? 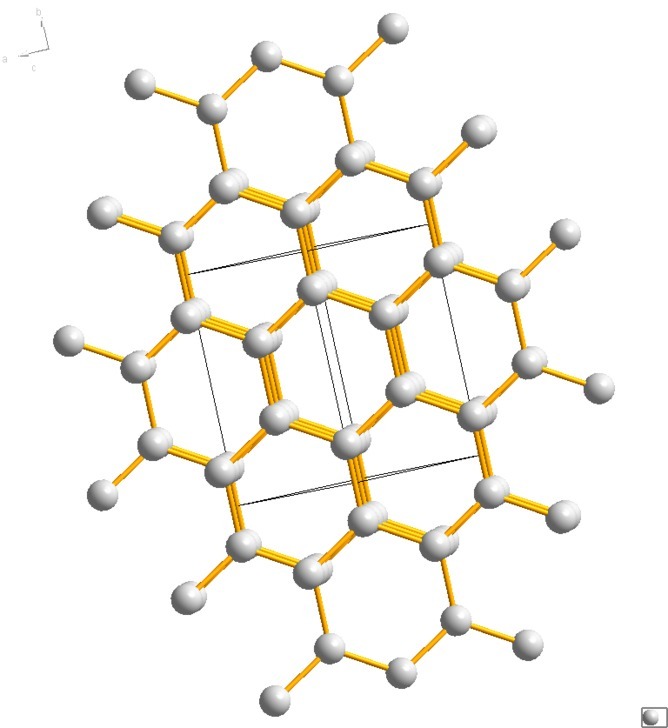 A quick spot of X-ray or neutron crystallography will reveal that LaB6 is built out of a simple lattice of bulky lanthanum atoms, in the cavities of which nestle boron octahedra. Perhaps unusually, there are no atoms at the centre of these octahedra. This simple structure proves to be more robust than most others in the natural world, with a melting point above 2200°C. Compare this to the 920°C melting point of pure lanthanum. So how does the addition of some tiny B atoms keep these La atoms from melting at high temperatures? Well, the above description of B octahedra within a La lattice turns out , to be the wrong way around: the B octahedra are in fact bonded very strongly to one another, forming a framework to which the La atoms are only weakly bonded, with very little La-La interaction as well. It’s been suggested that this is what makes LaB6 such a good material for electron guns: as the electrons are emitted and a surface La atom evaporates, a new La atom is easily able to migrate to the surface through the B framework as it is only very gently held in position. The structure is Lanthanum hexaboride is #1000057 in the open crystallography database. Most people will have heard of sildenafil citrate by its trademark name – Viagra. The active part of the drug is the complicated cationic species, which blocks an enzyme that has a detrimental effect on blood-flow to, well, we all know where to. What most people would not be aware of is that Viagra was also found to help hamsters to recover from jetlag. Seriously. This work won the Ig Nobel prize for aviation in 2007. The structure shown above is Viagra monohydrate (with the water not shown in the picture). From a crystallographic perspective, the structure contains a lot of hydrogen bonding interactions from the carboxylic acids of the citrate counter-anion to the cation, which contains a number of basic nitrogen sites, and to other citrate anions. Polycarboxylic acids are often used in crystal engineering due to their ability to form strong interactions and can be used to help crystallise important drug molecules. This structure was reported in 2005. H.S.Yathirajan, B.Nagaraj, P.Nagaraja, M.Bolte, Acta Crystallogr.,Sect.E, 2005, 61, o489. 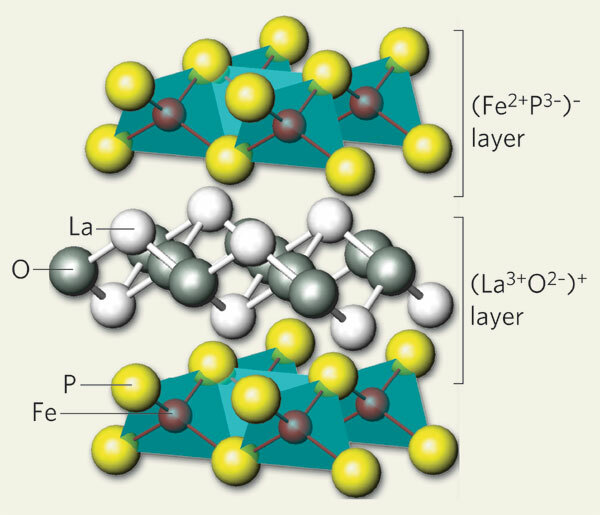 LaOFeP, also known as a ‘1111’ superconductor, is a layered structure which is considered conducive to superconductivity, similar to the Cu-O superconductors HgBaCaCuO, YBaCuO and LaBaCuO. A new class of superconductors came to the fore of scientific research around 2006 with the discovery of LaOFeP. While originally labelled as oxy-pnictides, they are now more commonly referred to as Fe-pnictide superconductors and involve compounds containing an element from group 15 of the periodic table (typically phosphorus and arsenic). Instead of relying on conducting layers of copper and oxygen, these new superconductors involve iron and pnictide conduction and so challenge the BCS-theory of superconductivity. These materials have been shown to exhibit typically lower superconducting transition temperatures when compared with the copper oxide superconductors. In this first example, LaOFeP was shown to have zero resistance below 3.2K . In 2008 the same group showed that by swapping P for As, the superconducting transition temperature of LaOFeAs could be raised to 26K . 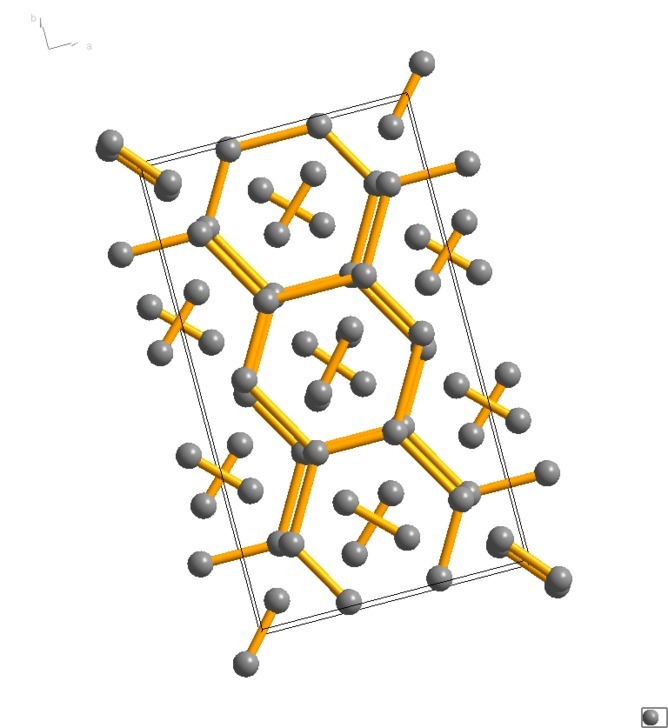 While the synthesis and crystal structure were first determined by Zimmer et al (Journal of Alloys Compounds, 229, p238 (1995), this picture was taken from Kamihara et al., JACS, 128, pp10012-10013 (2006) who were the first to report on the electronic and crystal structure of this material. Y. Kamihara, H. Hiramatsu, M. Hirano, R. Kawamura, H. Yanagi, T. Kamiya, and H. Hosono, J. Am. Chem. Soc. 128, 10012 (2006). Y. Kamihara, T. Watanabe, M. Hirano, and H. Hosono, J. Am. Chem. Soc. 130, 3296 (2008). The Polio virus, from structure 2PLV in the PDB image by David Goodsell http://mgl.scripps.edu/people/goodsell/ for the RSCB PDB http://www.rcsb.org/pdb/home/home.do. Today marks the anniversary of the first mass inoculation of children against polio. In 1954 children in Pittsburgh were inoculated using a vaccine developed by Jonas Salk. In 1988, based on the success of Salk’s and subsequent vaccines the World Health Organisation began the campaign to eradicate Polio. They are very close to achieving this – success will mean that polio will be only the third disease, after smallpox and rinderpest, to be eradicated in humans. The polio virus is a Picornaviruses, or “little RNA virus, and attacks cells by binding it’s outer protein shell to them, whist using the small amount of RNA it holds within the shell to replicate itself. Picornaviruses are a common type of virus to effect human health, as they include rhinovirus which causes the common cold. Picornaviruses and their crystal structures were featured by the PDB as their ‘molecule of the month’ where you can read more on them. The structure of the polio virus was found by Filman et al. in 1989, which is entry 2PLV in the Protein Data Base. There are at present a number of ‘grand questions’ in physics. From the search for the Higgs boson to the unbalance of matter and anti-matter in the observable universe, but the one that most interest me is the search for metallic hydrogen. Why? It’s the planetary implications. The planet Jupiter is very big and in the centre of it are extremes of conditions in terms of temperature and pressures that we cannot re-create here on Earth (yet). We’ve got a pretty good idea that the centre of Jupiter is going to be mostly hydrogen, as that is what most of the solar system is made of anyway. We know from gravity measurements that the centre of the planet is very dense. Jupiter also has a really interesting magnetic field. It’s massive and if we could see it’s whole effect, it would be bigger than the sun in our sky. So we know something strange is going on in the centre of Jupiter (and indeed all the other gas giants). And we even can observe the effect of this strangeness in the massive magnetic field. Is this all because at massive pressures hydrogen, which we are all more familiar with as a gas, becomes a metal? The theory goes that under extremely compressed conditions the hydrogen molecule breaks down and the electrons that orbit its nucleus will ‘delocalise’ and the material will become a metal. The first of these calculations, in 1935, predicted that this would occur at 250,000 atmospheres of pressure (equivalent to about 10 fully grown African elephants on one stiletto heel) but some of the first high-pressure experiments to get to those pressures soon found that this was not the case. Metallic hydrogen remained illusive. In the last couple of months there have been two major finding reported in the search for metallic hydrogen. The first was from a group in Edinburgh, UK, who collected data from hydrogen at 3.15 million atmospheres. Using spectroscopy they found a distinct change in the behaviour of the material, indicating that the atoms within had changed their arrangement. The possible structure of hydrogen at 3.15 million atmospheres. Looking to theory they noted the similarity of their measurements to those predicted by a graphite-like structure for solid hydrogen. Then a group in Washington DC, USA reported that they believe the hydrogen molecule is still intact and not metallic at 3.6 million atmopheres. They believe even at these pressures at least part of the structure is still made up of the H2 molecules that make up the hydrogen gas we are more used to. So now experimenters are at an impasse, it would seem the higher they go in pressure the more the hydrogen impresses them with the strength of its bond. It all begins to beg the question what if hydrogen doesn’t become metallic? Do the theoretical results need to be revised? Is there another way to describe Jupiter’s magnetic field? 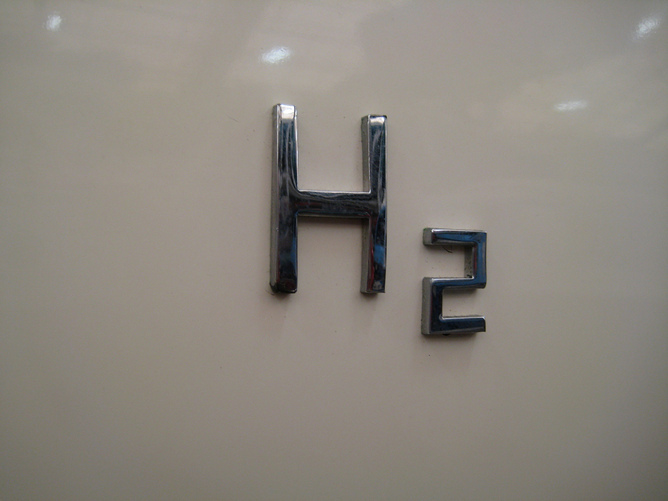 Hydrogen has long been used as a model system, because of its simplicity containing only one proton and one electron. The higher in pressure scientists observe hydrogen, the more complicated it would seem to become. So if even the simplest of things can be so perplexing, the mind boggles about what anything else in the universe will do!